Bride and groom on the golf course at The Pavilion at Sandy Pines in Demotte, Indiana. 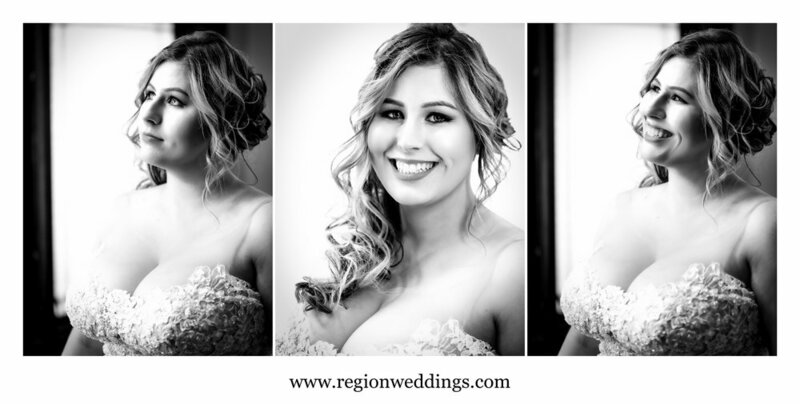 I started out in the bridal suite capturing hair and make up from the girls as well as details. Second photographer Bridget captured the guys as we counted down to the early afternoon reveal. Bridal prep at the bridal house at Sandy Pines. 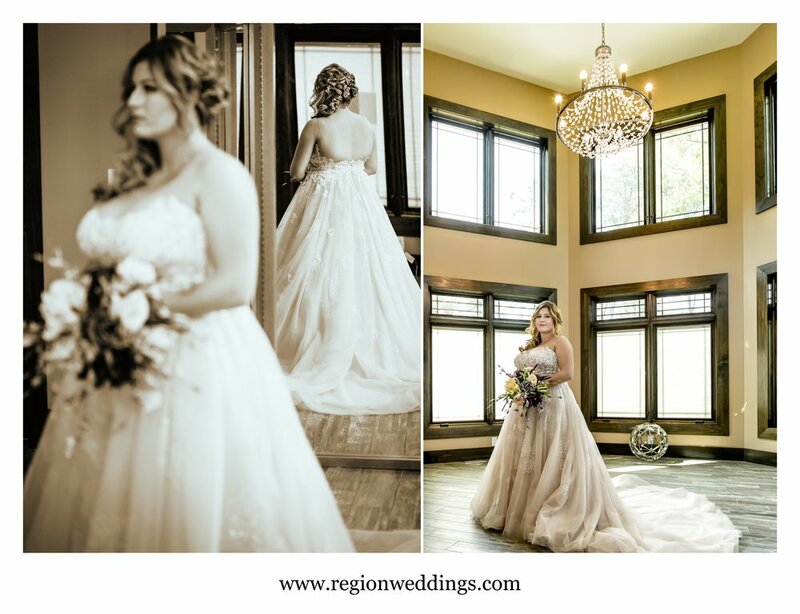 I had two wedding dresses to capture as Bethany shared the day with her sister Valerie. Dad surprised the bride with a quick visit as mom tended to the dress. Once the Converse All Stars were snug on her feet, it was time for some quick portraits of the gorgeous bride. Bride getting ready at the bridal house at The Pavilion at Sandy Pines. The bride in her wonderful dress at Sandy Pines bridal house. Keenin pulled up in his green Ford Mustang and of course we took some photos with him and his Mach 1 hot rod along with his wedding clothes. Groom wedding prep at Sandy Pines. The first look was very emotional and exciting as I took the couple to a shady spot on the golf course. Beth approached Keenin who was facing the opposite way and they slowly came together with smiles, tears and a kiss. 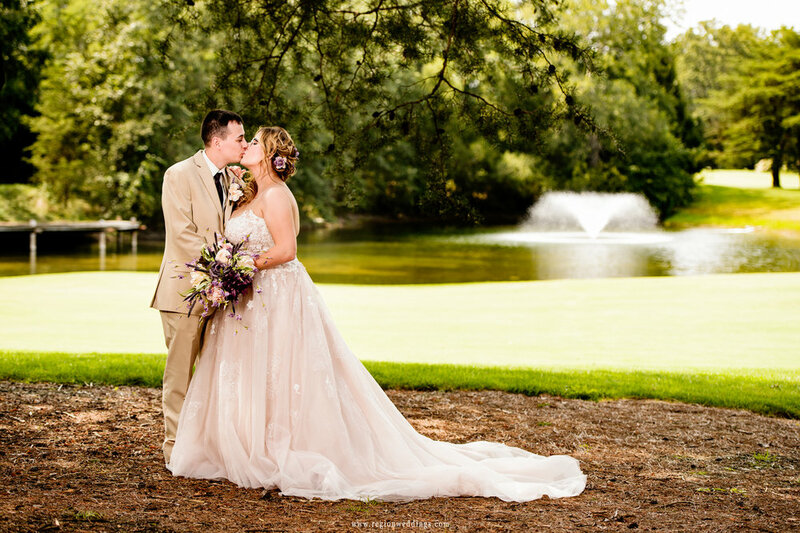 First look bride and groom reveal at Sandy Pines Golf Course. We explored the entirety of the sprawling golf course taking romantic wedding photos and Beth even got a ride on a golf cart courtesy of one of the club members!! Bride and groom wedding photos on the golf course. The bride and groom stand amidst the wildflowers. All of us were very excited to take some photos with Keenin's classic car and the groomsmen had it decorated while I had the couple away on the golf course. We had a fun time posing them with the green Mustang as well as taking it for a quick ride. 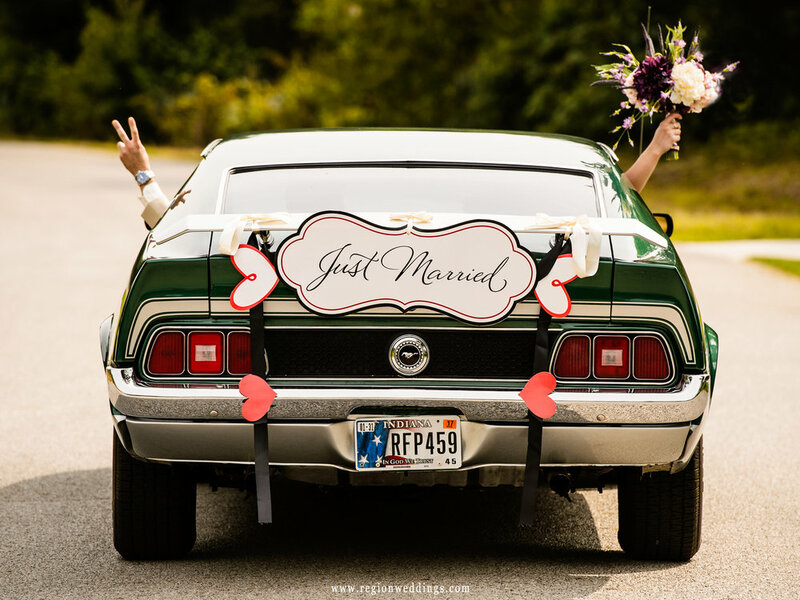 Classic car wedding photos in Demotte, Indiana. 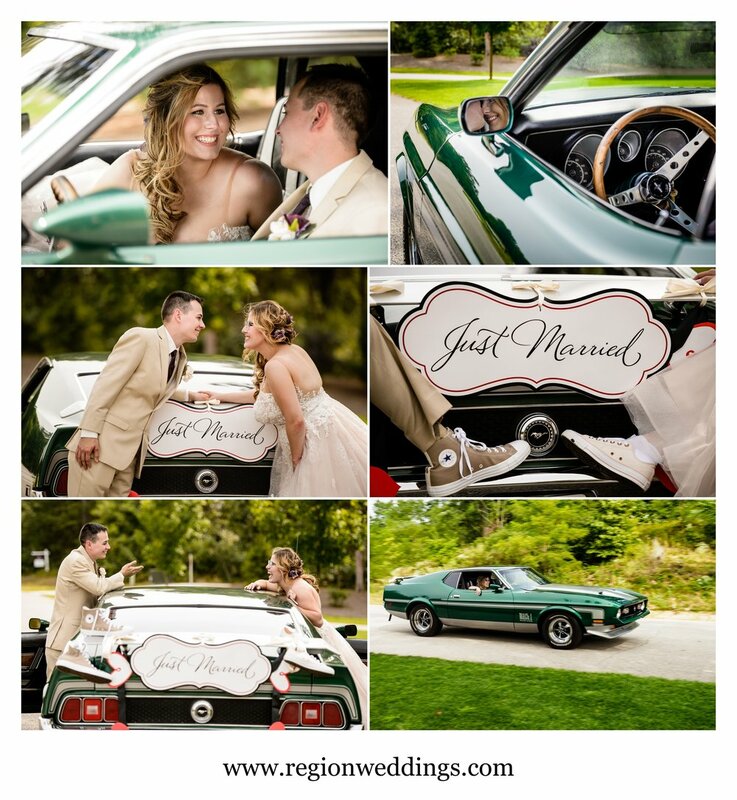 Bride and groom getaway drive in a classic Ford Mustang. A few more wedding party photos and then guests started arriving for the late afternoon outdoor ceremony. Bridesmaid and groomsmen photos at Sandy Pines Golf Course. Bride and groom looking fashionable underneath the tall trees at Sandy Pines Pavilion. The outdoor wedding ceremony at The Pavilion at Sandy Pines in Demotte, Indiana had lots of emotion as the groom's mom teared up after being walked down the aisle by her son. Bethany and her Dad came down the aisle with sister Valerie as the SRO crowd of friends and family looked on. The outdoor wedding ceremony area at The Pavilion At Sandy Pines. Dad walks his two daughters down the aisle. Outdoor summer wedding ceremony at Sandy Pines Golf Course. The wedding receptions at Sandy Pines are lovely open air events under a roof. Guests ate dinner and danced the night away while enjoying the fruits of summer. Of course a trip to the photo booth for some goofy fun was in the plan as well. Open air wedding reception at Sandy Pines. The bride and groom dance underneath the stars at their summer wedding. 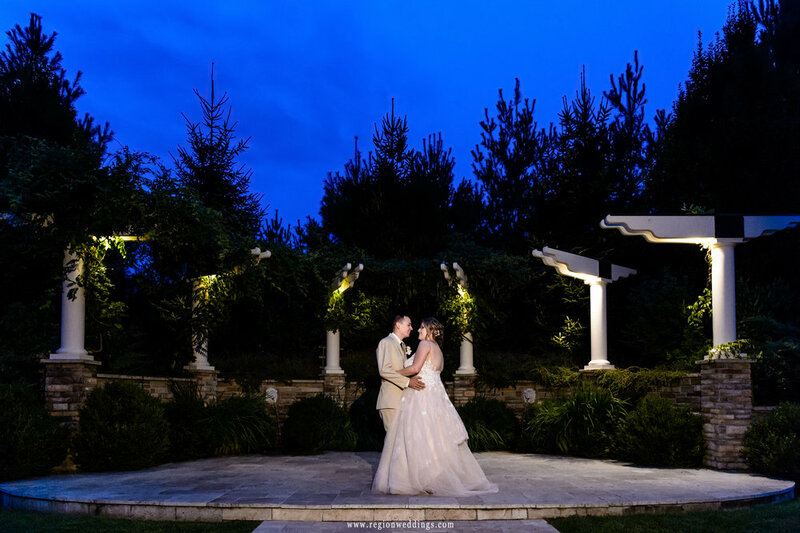 I hope you have enjoyed this sneak peek look at Bethany and Keenin's outdoor wedding at The Pavilion At Sandy Pines in Demotte, Indiana. 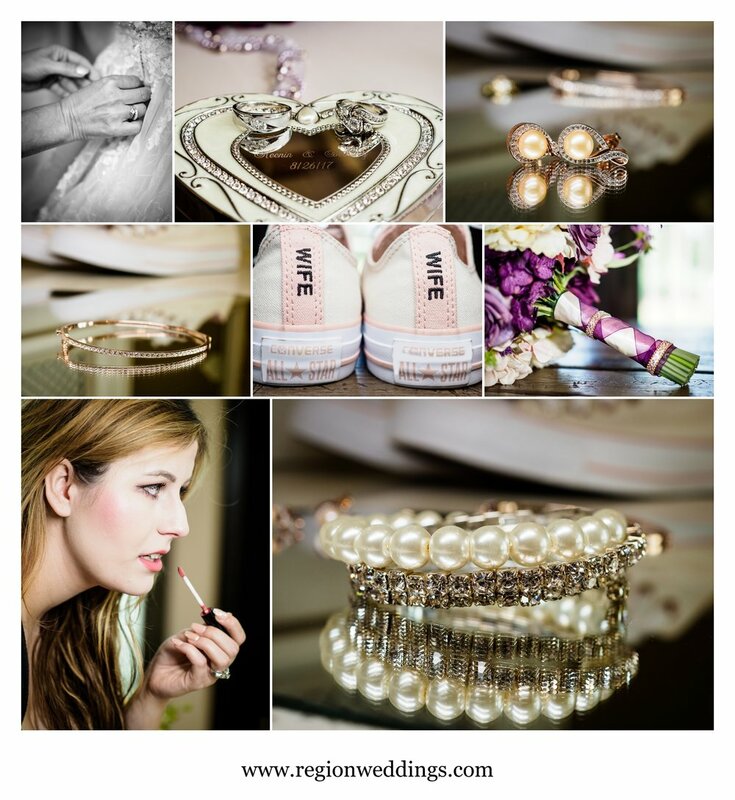 To inquire about your big day, please fill out the Contact Form to set up a meeting.